It’s Mother’s Days, so what better film to cover than “Postcards from the Edge”, Mike Nichols’ 1990 drama comedy of a disfunctional mother-daughter relationship. New DVD screencaptures from the film have been added to the image library, three clips from the film can be found in the video archive – with a bonus clip of Meryl performing “I’m Checking Out“. Also, be sure to have a look at this 1991 segment from E! 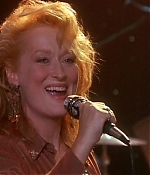 Entertainment, featuring an interview with Meryl and on-set footage from the film. Production notes and my review after the cut. As always, share your thoughts on “Postcards from the Edge” in the comments. All of her life, Suzanne Vale has been Doris Mann’s daughter, a big movie star’s daughter,” explains Streep, “and this is the story of her shaking off that Doris mantle and coming out and becoming herself at last. I think it’s a really interesting story, not just for movie stars with progeny in the business, but for anybody who’s got an indelible character for a mother or father.” “What attracted me to this project,” observes MacLaine, “was not only the mother-daughter aspect – because, God knows, I’ve done those before – but the fact that this was also a picture that for the first time told a really sensitive and authentic story of the pressures of Hollywood. Doris offered me the opportunity to play an aging woman who still looks beautiful and allowed me to recall all the feelings that I had as a mother, wondering whether I was overshadowing my daughter.” “There were three factors that attracted me to this film,” recalls Nichols. “I always thought that Carrie approached a lugubrious subject with energy and humor and vitality; comedy is a good way to get at something that you can’t necessarily examine in a serious approach. And when drugs and alcohol in the upper-middle class are approached too soberly, it comes out like afternoon television. “I have always found it interesting to consider the relationships of women and their mothers,” he continues. “And finally, everyone has a fascination with show people and with show business. Movie people are maybe the last royalty – although there’s nothing royal about them – and people love to read and hear about them. And I just wanted to explore this alien world – which has always seemed very funny to me, with its own customs and own laws, both written and unwritten, and its own politics – in a way that might show audiences that all lives are similar.” With Nichols committed to direct “Postcards From the Edge” and Streep – who had worked twice before with Nichols (on “Silkwood” and “Heartburn”) agreeing to star in the film, the project took on a life of its own, attracting an impressive collection of first-rate actors. “Mike Nichols’ great gift is that people want to work with him, so once he and Meryl were on board it was like giving a party – let’s say a party in honor of Meryl and Mike. Who’s not going to come? Well, everybody came,” recalls Fisher. “Postcards” lives from Carrie Fisher’s brilliant writing, making it a quoteable film. Suzanne – “designed to be annoyed” – is not a character you would associate with Fisher at once – at least I’ve never watched this film as a biopic on Fisher’s life. Rather, it’s a sharp look at the film industry, the way actors are treated on their way down, but mostly a portrait of a very disfunctional mother-daughter relationship within the machinery of Hollywood. The acting of Streep and MacLaine is outstanding, as is the rest of the cast. The film bursts of great actors in supporting roles and cameos – Gene Hackman as Suzanne’s director, Rob Reiner as her producer, Richard Dreyfuss as the doctor, from Dennis Quaid, Simon Callow and Oliver Platt to Anthony Heald and Annette Bening, all actors are featured in small but great roles. They and of course Streep and MacLaine make this a movie to be recommended. The aspect I’ve enjoyed probably most of the film is the portrait of an older actress struggling with her life. Usually with a storyline like this, you expect a twenty-something year-old actress – just as we are used to from today’s celebrities and tabloids. But having a middle-aged actress struggling with drugs and a fading career is a reminder that addiction is not a question of age. Also, no matter how old you are, if you still have parents you will always be a child. Both topics are wonderfully observed in “Postcards”. I’d rank this performance among Streep’s best. 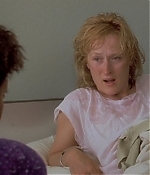 She deserved her Oscar nomination for playing Suzanne – although Kathy Bates was a fair winner for “Misery”, given the fact that also Anjelica Huston gave a career-best performance in “The Grifters” and 1991 has been a crowded place with many fantastic performances that year, it’s nice to see Meryl on the list anyway. Another fantastic Mike Nichols film.